This page outlines the common usage of HMFcalc, along with information concerning the various parameters and options included. Much of this information is a modified rendition of this article, which accompanied the publishing of HMFcalc. Read on for information about common usage, the transfer function used, the cosmological parameters and the fitting functions. HMFcalc is built to be easy to use. In the simplest example, the only action required on your part is to navigate to the calculator and click "Calculate!". All required options and parameters are filled with sensible defaults and ready to go. Nevertheless, most users will want to fiddle with the parameters to tune them to their particular needs -- be it a survey, simulation or investigation. The options and parameters in HMFcalc were chosen to give as much flexibility as possible without making things overly complicated. They are split over two tabs in the calculator, one for general run parameters and options and the other for cosmological parameters. Several of the input fields indicate that they require a comma-separated list. For these parameters, you may specify as many input values as you wish, and all possible combinations of all parameters will be calculated. This can multiply very quickly, and so we have placed an overall maximum on the number of calculations to ensure our server can handle it. The exceptions to this rule are the cosmological parameters. These are treated as 'sets', in which the first entry for each parameter is taken as a set, and labeled with the first given label. If there is a second entry for any parameter, then all second entries are taken, along with the first entries of any parameters that only have one, and the second entry for the label. This carries on, with the number of labels equivalent to the largest number of entries for any parameter. One more flexible field is the Custom Fitting Function. It takes a string representing an equation in python syntax, in terms of a variable x. The equation forms a desired fitting function, with x taking the role of the mass variance. No other explicit dependence may be included (such as redshift or overdensity), nor may the equation be multi-lined. It must be a single equation in terms of the single variable x. Future versions may include a generalisation of this feature if sufficient interest is shown. There is a row of options titled "Optional Extra Plots" on the main tab. These are calculations that are not inherently performed along with the differential mass function calculation, but which many users may find useful. This is especially true of the cumulative mass function, N(>M), which is checked by default. The primary focus of the cosmological parameters tab is the production of the transfer function, which we discuss in the next section. Previously computed at high resolution by CAMB and included as a default option. Computed on-the-fly with arbitrary cosmological parameters. We describe some of the details of each method in this section. This is the default option. It is selected by choosing a popular cosmology from the "Transfer Function" drop-down list. Parameters of that cosmology that affect that transfer function in any way are internally set and made non-modifiable so that no confusion arises. Parameters that are relevant to the cosmology and prescribed in the relevant paper, but which do not affect the transfer function, are set by default to their proper values but are still modifiable. This option does not allow the automatic generation of HMF's for several cosmologies, except for in the transfer-independent parameters, as only one default may be chosen at a time. However, you may use the "Add Extra Plots" feature after generating a HMF to add different default cosmologies. As mentioned, each of the default cosmologies is a high-resolution transfer function from CAMB. In each case, all parameters of the run (and there are many) were the same, except for the cosmological parameters. The following table shows the values for each of the cosmologies, where each set of parameters was taken from a corresponding paper, linked from the heading. Note that the ns and σ8 are not used to calculate the transfer function within CAMB, but we list their values here for completeness. For completeness, we also list here the values of the other parameters used for the CAMB runs. Note that these are values used for the high-resolution default transfer functions. Where the on-the-fly runs differ from these, we note their value in parentheses. Parameters that do not affect the transfer function whatsoever are intentionally omitted here for brevity. To select this option, choose "Custom Transfer" from the "Transfer Function" drop-down list and then upload a file using the "Upload Transfer Function" tool. The user must be careful using this option. There is no way for HMFcalc to know what cosmology the uploaded transfer function was calculated with. The user must therefore be careful to set the correct corresponding parameters. 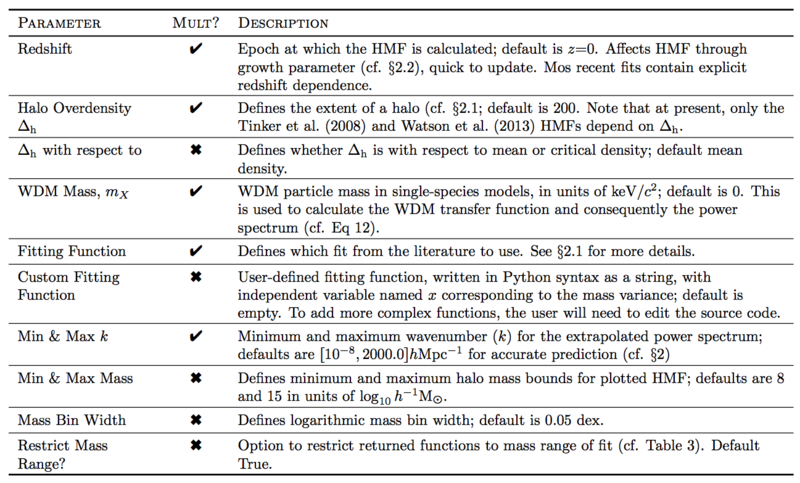 Note that only parameters that affect both transfer and the mass function explicitly (see cosmological parameter table) need to be set accurately. Parameters affecting only the transfer function will not be used within HMFcalc, and parameters used only in HMFcalc will not be at odds with the transfer function. However, for later reference it is still better to set every parameter properly, as the parameters are written to file which may later be read. The file uploaded in this manner should be in the same format as a transfer function produced by CAMB. That is, it should consist of one column of k/h values, followed by 6 columns of transfer function values. The last column should be the total transfer function. This option is selected if a custom transfer function is chosen, but no file is uploaded. In this case the user may choose a calculator to use. Currently only two options are available - CAMB and the Eisenstein-Hu transfer function (which is calculated using the cosmolopy package). If CAMB is chosen as the calculator, HMFcalc only offers the cosmological parameters as input parameters to CAMB. All other parameters are taken as the defaults from the backend hmf package (listed in the camb parameters table). This is both to save computation time (the defaults are the most efficient to achieve requisite accuracy at high mass, see the linked article), and to avoid unnecessary clutter in the options. We have discussed already that the options and parameters of HMFcalc are split across two categories: run parameters and cosmological parameters. We here show two tables which outline the function of each parameter. We first have the run parameters. In this table, the "Mult?" column specifies whether the given parameter accepts multiple entries (separated by commas). Secondly we have the cosmological parameters. The "Affects" column specifies whether the parameter affects the transfer function (T), the HMF (H) or both (B). One of the features of HMFcalc is its wide array of fitting functions from the literature. We aim to include any fit from the published literature that we find, and encourage you to contact us if you know of a fit which we have not included. Generally, for observational purposes, choose an SO fit, but for halo-model calculations choose an FOF fit. For a concise summary of the functional forms and respective properties of each fit, download this table, which will remain a standalone, updated version of Table 3 in the article describing HMFcalc.